Painting your front door properly can be an extremely rewarding experience. It’s the ‘wow factor’ as you return home to see your glistening front door awaiting you, welcoming you home. So we, GSD Painting and Decorating contractors London, are going to explain how to paint your front door properly. The ‘number 10’ door look, is a famous saying across the country, but how do you paint your front door to this standard? Let’s make the external of your home stand out! We recently painted this property in Loughton, Essex where the customer had extremely high standards but had previously had bad experiences with all the decorating firms they had used. The property was a 1940’s style home and they owners wanted to keep as much of the original feeling as they could, even refitting all stained glass windows into the property, which were extremely common in that period. How to paint your front door step by step? First step depends on whether you are painting your door in situ on its hinges or, if it’s a new door, or simply you would prefer to take it off its frame to paint it. We find in reality unless it’s a new door you would most probably paint it in situ. So the first thing to do is remove all the handles and tape up all hinges and remaining ironmongery. For this we would recommend using a good quality low tack masking tape. Low tack tape is more expensive than normal tape but it’s worth it in the long run. The second step and probably the most painful part of painting your front door, is to strip and prepare the door. Ideally to get the best possible finish you should strip the paint right back to the wood. Many front doors can range from a few years old to a few decades or more and can be coated in layers and layers of paint, put on by previous owners. If you want the real ’10 downing street door look’ you will want to remove all the old paint from the door. There is no easy way to do this, in recent times product manufacturers have released magical lotions that are meant to strip the paint off without any hard work. In reality they never quite work like this. You can burn off the paint using a mini blow torch and scraper. Or white spirit and and scraper, but what you will defiantly need is a lot of elbow grease. 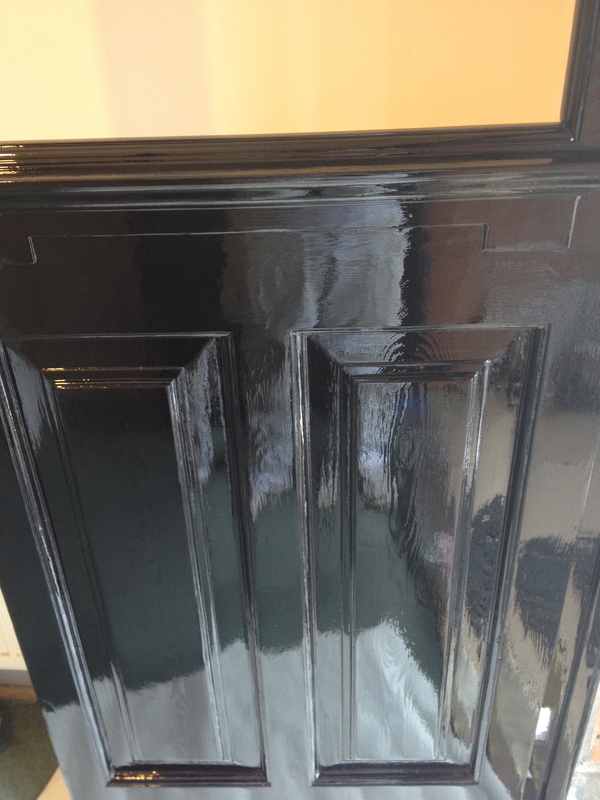 Once you have striped and sanded the door using some good fine grit sand paper, you will need to fill any blemishes with good quality wood fillers, decorators chalk and putty. Fill and then sand back any areas that need attention. Once you have prepared the door it is time to start painting it. The first coat should consist of a good quality wood primer. As professional decorators we only use the best quality materials available when carrying out work. Many different products have different positives and negatives. With most decorators having their own brand they prefer. I dont think there are to many right and wrong answers with this, just ensure you use a reputable brand. GS Decorating use various brands dependant on the finish required. From modern brands such as Dulux and Mythic Paint, designer brands such as Farrow and Ball or Paint Library or traditional paints such as Little Greene. You can read more on the various different paint brands here Ensure you paint all six sides of the door (front, back, two sides, top and bottom). On wood panels, we recommend to paint the panels first, moving onto the edges after. After the priming coat has dried the next step is to paint the door in one coat of undercoat. On this door in the picture beside we have used Dulux Trade grey undercoat. Again there are many different brands you can use and each give a certain finish. Make sure you use a good quality brush when painting your door. We recommend American brands such as Purdy or Wooster. They’re much more advanced with painting and decorating products, compared to the UK. Investing in a good quality Purdy or Wooster paint brush is more pleasurable when applying the paint. The synthetic brushes also seem to hold more paint than traditional brushes, saving you time dipping in and out of the paint pot. The final step of how to paint your front door is to apply top coat, we like to apply at least two coats of gloss (or chosen finish) to really make your front door shine. Take your time when applying the paint and make sure you sand off in between coats with a good high quality fine grit sandpaper. If you do so and follow all the above stages you should get your door looking absolutely amazing. Shiny enough to see your own reflection in it, as you return home at the end of a day. In the US many of our American counterpart decorators would spray finish doors and as high quality decorators in London we can also offer this service. Spraying paint in the UK is not quite as common as in America. Not really sure why but it will probably get more and more common over the years. It’s probably due to the expense of purchasing spraying kit or the weather. But also many people still prefer the hand brushed finish, I know we do. Like with all good decorating, as you can see the key is in the preparation. Good prep will make sure you end up with a great finish you can be proud of. If you want your home decorated to this high standard and you live in London or home counties, why not give us a call and see if we can help. We do hope that this article on how to paint your front door has been helpfull. First of all, great article. A very thorough step-by-step guide on how to paint your front door, which I wouldn’t hesitate to pass onto friends and family should they want to take on this DIY project. I know from first hand experience that it’s not one the easiest tasks to pull off but you definitely take the guesswork out of it and the final product looks fantastic!